Former Olympian Isaac Dogboe came up huge in his first real test as a pro, handing the iron-tough Cesar Juarez the first stoppage loss of his career to win the interim WBO super bantamweight title. Despite Juarez’s (20-6, 15 KO) experience in brawls, Dogboe (18-0, 12 KO) came out slugging, unleashing an endless storm of left hooks to the head and body. He floored Juarez hard with a hook/jab in the second round, but ate some quality blows in ihs pursuit of the finish. Juarez found some life in the third round, landing a powerful series of body shots and shrugging off some huge head punches from Dogboe, but the Ghanaian’s speed and sharpness kept him in control. 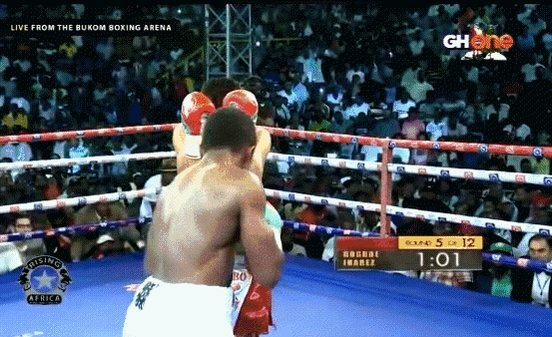 One round later, Dogboe found the mark with a left hook so hard that it took Juarez’s body a second or so to realize there was nobody home. He was wobbly on his feet when he rose, undergoing what began as a count. However, rather strangely, Tony Weeks did not do the full count of the wobbled Juarez, cut it short to end the fight, while Juarez with outstretched hands, protested in vain, to the ecstasy of the wildly partisan crowd. The jubilant crowd kept the celebrations going deep into the night. “Regular” champ Jessie Magdaleno, whom Juarez was booked to face before the former suffered an injury, is set to fight on March 10th against a yet unnamed opponent. No word yet as to whether the “Royal Storm” Isaac Dogboe will get the chance to step in.